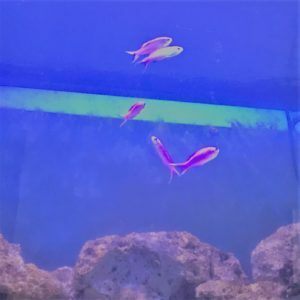 When you jump into saltwater tanks there is a million dollar question: “Do I want an all fish tank, or do I want a reef tank?” Reef tanks offer some BEAUTIFUL corals, anemones, clams, etc. 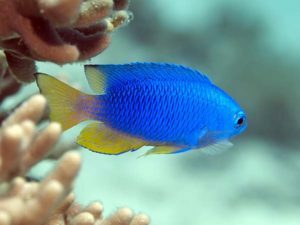 “All fish” tanks offer the super exotic fish that don’t necessarily play well with corals and invertebrates or each other in some instances. We were really excited to have a reef tank and hit the ground running to get it going; then I immediately panicked because I didn’t know at all about what I could put in the tank. So, I hit my local store and that fabulous thing called Google. 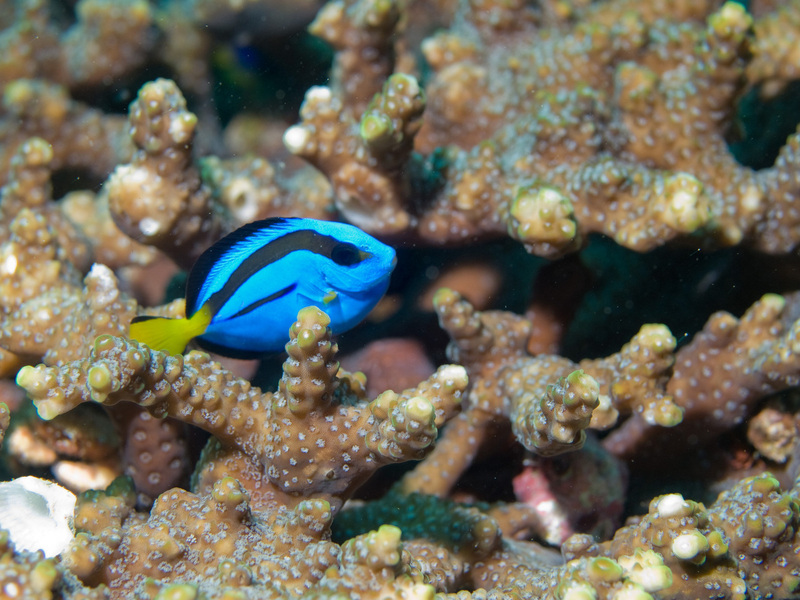 First and foremost, a reef safe fish is one that will play nice with your corals and invertebrates in your tank. 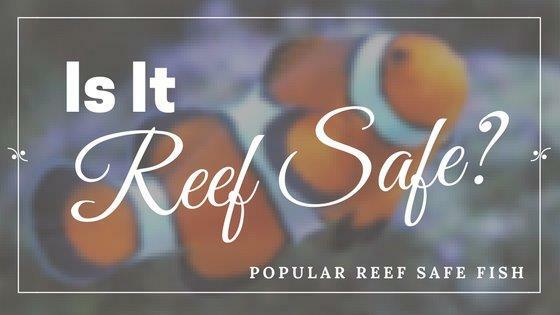 Reef safe fish will not nip at your corals and won’t snack on your snails and shrimp for a midday meal. There were bunches of things that I didn’t necessarily account for when looking for my fish. For instance, are the fish reef safe AND invertebrate safe? What is the temperament of the species? Can you have more than one? What size tank can I have with a particular species? So. Many. Questions. 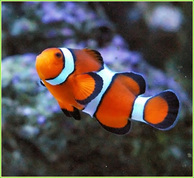 Here’s what I came up with: Clownfish are a general “go to” fish when having a reef tank. By the way, there are different colors and even species. There are designer clowns, versus a “Nemo” looking clown that most of us know and love. Clowns are really interesting fish, typically hosting in an anemone or coral that closely resembles an anemone, or it can be crazy like mine and host in the upper corner of the tank by the overflow. Generally, clownfish have mild temperaments and play well when they are in pairs. Depending on how large a tank you have, sometimes it is beneficial to limit the number of clown pairs you have as they can be aggressive towards their own kind. For instance, in my tank I can have two pairs of clowns because they can stay on opposite sides of the tank all Westside Story like. Then you have your Anthias. Anthias are awesome! They are bright and brilliant in color, and are a great schooling fish. 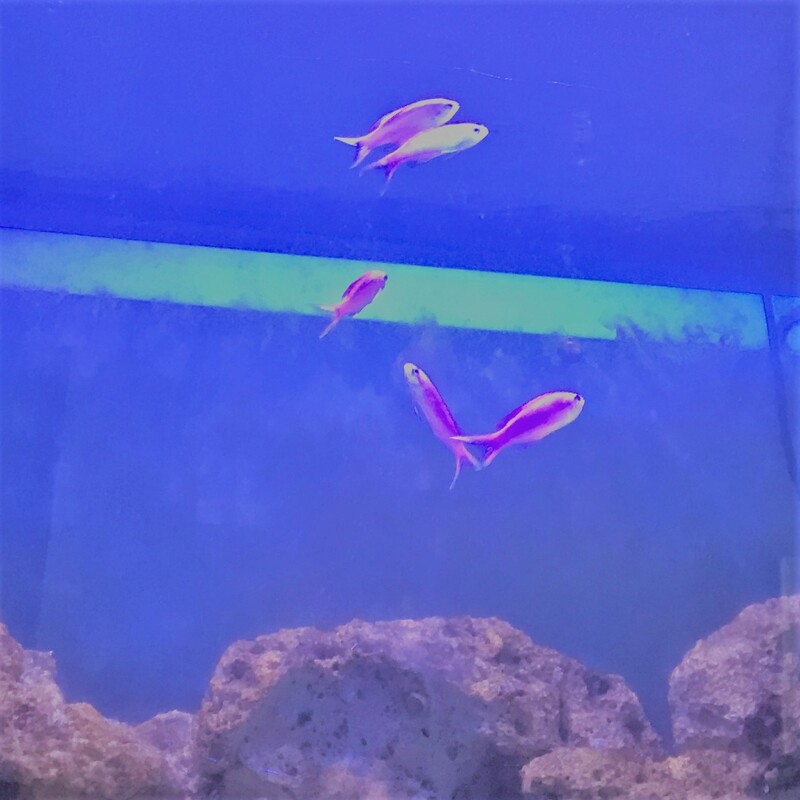 I have four Purple Queen Anthias and I love them. Anthias come in a variety of colors and generally have peaceful temperaments so they make a good addition to a reef tank. Next, you have a beautiful Royal Gramma. 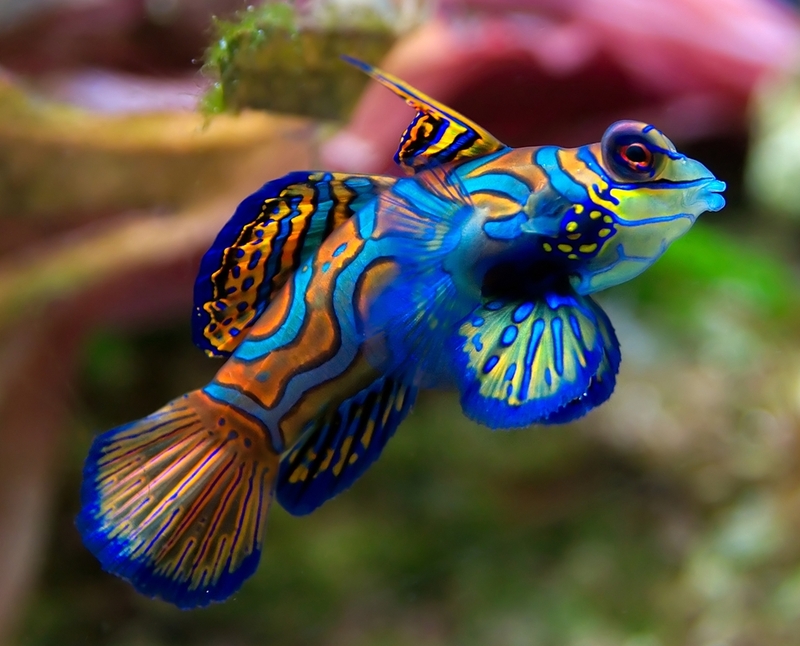 Originally from the Caribbean, it is such a stunning looking fish. It’s vibrant colors of purple and yellow are amazing. Overall, they have a peaceful demeanor they will playfully chase away other fish that get close to it. Yes, I know that sounds like he is a jerk, however he means well. Blennies are the next kind of fish that I want to talk about. I do not have any yet, however overall Blennies are reef safe. With some species, they can have a semi aggressive temperament especially towards other Blennies. There are some like the Lawnmowers or Ruby Red Dragonet that act cool as a cucumber. Cardinals are overall cool looking fish. Whether you’re looking for a Bangai or a Pajama Cardinal they are really a nice addition to a reef tank. I personally like the Bangai best but all of them are neat. Overall, they have a peaceful temperament and will play nice with tankmates. Cardinals typically play better when they are in a larger group. They like to school around the tank. Damsels can be really cool for a tank. The variety of Chromis are found in this species of fish. Chromis can be a beautiful addition because they add vibrant color to the tank. Chromis typically school so they play better when they are more than one. Be cautious with some species of other damsels. 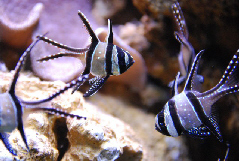 Although they are completely reef and invertebrate safe, they might break bad on other fish especially other damsels. Dottybacks generally are okay to add to a tank. Be cautious with some types of Dottybacks because they will try and run your tank. Some are very bold and will nip at your invertebrates. 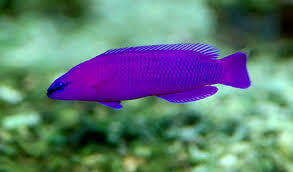 There are a couple species that will play well with others such as: a Neon dottyback or Orchid Dottyback. One of my goal fish is a Goby, more specially a Mandarin Goby. 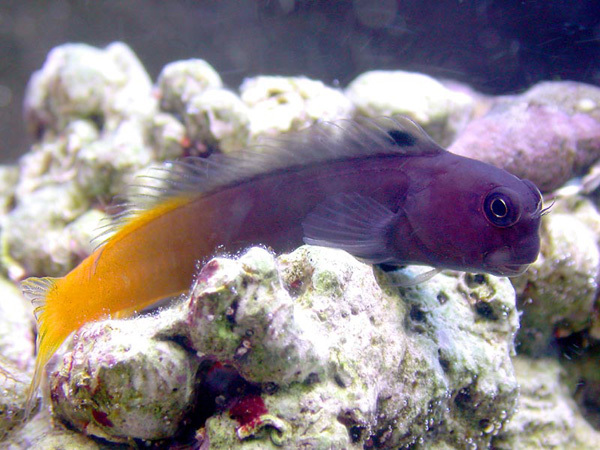 Generally, gobies are a nice additional to a reef tank. One thing to watch with a Goby, along with some other types of fish: keep a lid on your tank because they will attempt some Evel Knievel stunts, which we all know isn’t probably going to end well. Mandarin Gobies though are breathtaking. Their bright, vibrant colors add an extra exotic look to a tank. I am still building copepods in my tank otherwise there would be a mandarin in my tank right now. Then, there’s Dory. Tangs are such a beautiful fish and I am probably moderately obsessed with these fish. I personally have a Lavender Tang and its quite possibly my favorite fish in my tank. It is so beautiful with its coloring and is full of personality. Some tangs have a good temperament however some can be a little aggressive towards other tangs. Just be cautious when adding more than one, make sure you have the space to accommodate. I would highly recommend having at least one in a reef tank because they are so darn pretty and great at keeping algae under control. Squirrel! I mean, squirrelfish. 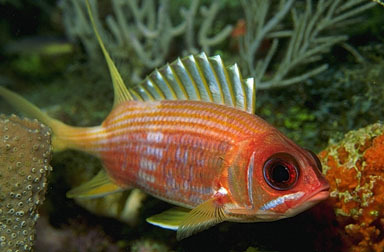 Be cautious with some species of squirrelfish because some are NOT invertebrate safe. 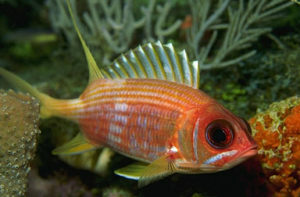 However, if you wanted to be super awesome, you have a ninja squirrelfish aka the samurai. They are completely safe to add to a reef tank because they won’t, ya know, eat your shrimp and stuff. 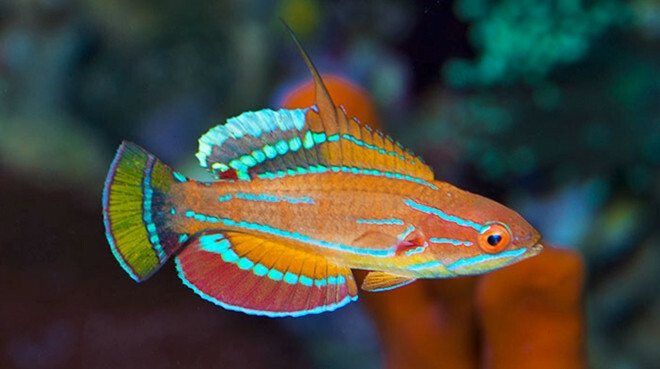 Last but certainly not least, you have the Wrasse. Wrasse are beautiful and vibrant in color. Be careful with some wrasse though because some can try and run your tank and eat your invertebrates. Just make sure you get one that will play well with others and not try and be the boss of the tank. A couple things to keep in mind about all these fish: they all like different kinds of food. Tangs are algae eaters and will eat ALL DAY LONG and love a good algae sheet on the side of the tank. Most of these other guys love mysis shrimp. Mysis shrimp is kept frozen and you thaw out pieces so you can feed your finned friends. The fish in the tank generally need to eat one to two times daily. Also, keep a lid on your tank. Some fish have a tendency to jump and as I said before that doesn’t end well for anyone. Whew! That was a lot of information to go over. 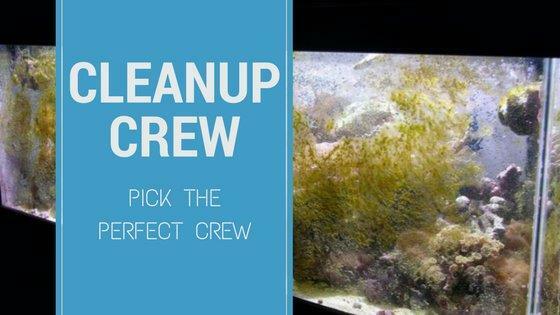 I hope this helps on what types of fish would be a good addition to a reef tank.